Trippin’ over dippin’ — into fondue. You? 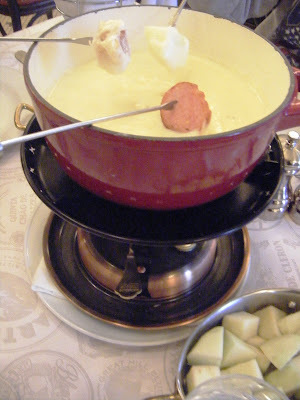 It was not-so-skinny dipping over the past few weeks as I went in search of fondue, seeking out the Swiss classic and its many variations for today’s Ticket roundup. 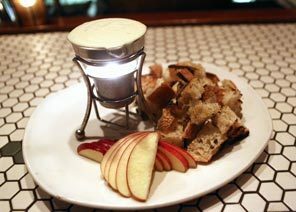 I found fondue aplenty, at obvious places like that Bellevue bastion of cheese-in-all-it’s-glory, Artisanal — where I tried the fondue du jour. On the jour I visited, 30 different types of cheese were melted into the mix. Or so they said. It could have been four cheeses, or 17, and after a few ridiculously rich mouthfuls I couldn’t have told you the difference. But rest assured, I was forking it up like a lonely goatherd who’d just come in from a long stint on a cold mountain. 30 different types of cheese in a single fondue at Artisanal — but who’s counting? We started with a cheese fondue, ended with chocolate fondue and in between shared a couple signature combos (raw meat, chicken, seafood that we speared and cooked in a pot of simmering court bouillon). At the Melting Pot tables have electric heating elements set into their tiled tops — kind of like those grills at Korean barbecue restaurants. And speaking of which, if I’m going to cook my own meal in a restaurant, I’d much rather go out for Korean food. But that’s just me. What it looks like in real life, courtesy of my cheap point-and-shoot camera. When people talk about noshing at the Palace Kitchen, they’re apt to carry on about the wood-grilled chicken wings or the olive poppers. So, how have I missed the fact that for years, the menu has also featured goat cheese and lavender fondue? That stuff, with Dahlia Bakery bread and sliced apples for dipping, is now on my permanent hit-list. 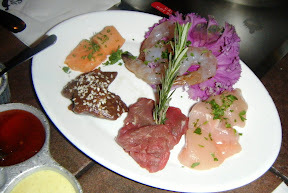 The Cambozola fondue at Pair in Ravenna is also a menu standard. In fact, I told readers all about it when I reviewed the place after it opened in 2004. The Palace fondue (left), Pair’s fondue (right). Do I see a theme here? 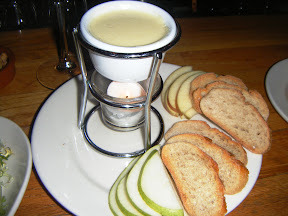 OK, I saved the best for last: the fondue at Olives Cafe & Wine Bar in Edmonds: my neighborhood hangout. I mean, come on! 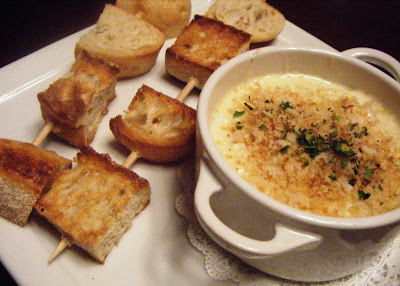 Fresh Dungeness crab fondue? Need I say more? I don’t have to but I will. When the per-pound price of fresh Dungeness hits the stratosphere, chef/owner Michael Young takes this bestseller off the menu. But he says the price has been right for months now, and things look promising for the foreseeable future, so I’ll breath easy. Or not, seeing as my jeans feel just a little bit tighter this week after all the cheesy goodness I’ve been knocking back. Dungeness crab and artichoke fondue at Olives. Whoa, Nelly. 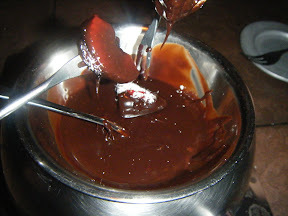 Now tell me: where do you get your fondue fix?